Or rather, these — the amplifier is new as well. During the spring, I was remixing a few Eponymous 4 songs, laying down guitar tracks on my beginner’s Fender Stratocaster, and I came to the conclusion that I really don’t like playing that guitar. My usual go-to guitar is my acoustic, and the Strat I have sounds really bad if I don’t attenuate the pressure of my fingers. Also, the fretboared is a bit narrow for my pianist fingers. 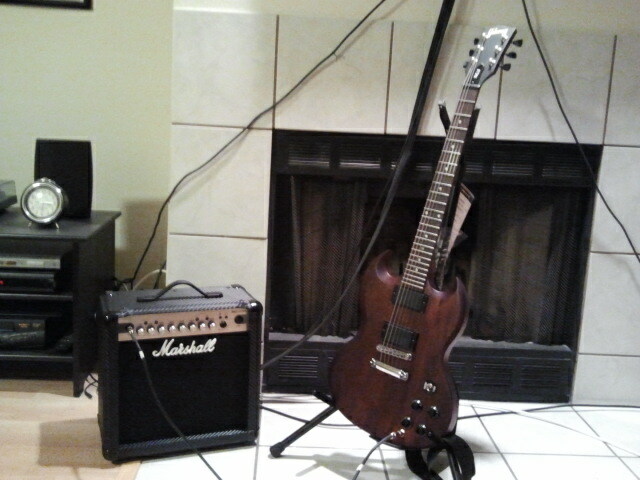 So I went down to Guitar Center and chatted up one of the salespeople, who steered me in the direction of Gibson. I tried a few and decided, yes, I would like to get a Gibson guitar. But not right then and there. I was still paying off the acoustic-electric I bought the previous year. I told the salesperson it would have to be a Christmas gift to myself. Welcome to Musicwhore.org, a vanity music blog where I tell an un-listening world what has been occupying the most time on my player. It tends to be heavy on Japanese indie rock and modern classical music, but I do make room for classic college rock (think Fugazi, the Smiths), and an occasional pop artist from time to time. In the past, I thought it was my job to proselytize, to convince you that hey, what I’m writing about is cool and you’d like it. I don’t think that any more. I like what I like, and you like what you like. And if you get bored with what you like, you might find something in what I like to make it something you might like. What isn’t my job is finding what will be hot and make you cooler than everybody else. I leave that to other blogs to care about that kind of thing. Instead, I write about music that at times may be hard to understand — especially if you don’t speak Japanese — and more often harder to acquire. And if you’re the adventurous type, you just might discover a whole ecosystem of listening that you may not have realized existed. And if that happens, then perhaps I’ve done my job. I’ve been pretty mum about the situation in Japan, mostly because there isn’t anything much I can add to what’s already been said. I’ve also tried to avoid reading and watching coverage of the quake because it would just break my heart. So I instead donated $50 to the Red Cross, although Steve over at Engrish.com suggests making donations directly to the Red Cross in Japan through a special landing page by Google. As for the tsunami that hit Hawaiʻi as a result of the quake, I can report none of my family were affected by it. My mom’s house is located inland, and I doubted she would be up at 4 a.m. walking by the beach. Still, I was up at 7 a.m. in Austin, watching the news coverage on the web as the waves struck Honolulu.